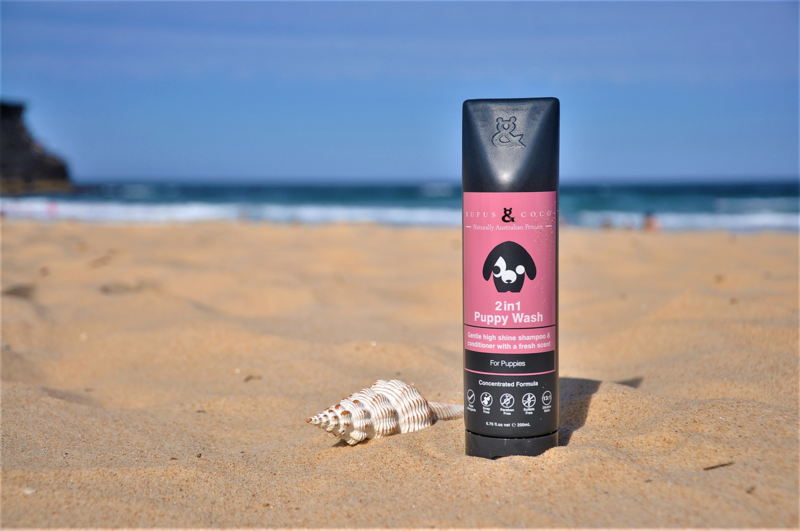 Formulated for your puppy’s sensitive skin, 2in1 Puppy Wash is a gentle shampoo and conditioner in one for quick and easy grooming. 2in1 Puppy Wash is concentrated, so a little goes a long way! 2in1 Puppy Wash does NOT contain Sulfates, Parabens, Oxylates or Soap! How to care for your pup: First, get your little mate all wet with warm water. Speak calmly, and keep your movements slow so your puppy feels safe and calm too. If your bath or floor is slippery, place your pup onto a towel so their footing is secure. Now, apply some Rufus & Coco 2in1 Puppy Wash to a few different areas of the coat, and massage it in to get a really good lather going. Then simply rinse, and towel or chamois dry. Do this whenever your pet needs a wash, and use Rufus & Coco’s 3in1 Pamper Spray after or between washes for a super glossy rockstar finish. I am loving life as a pup. The adventure, the hugs, the dirt..! You don't? Well thank heavens for Rufus & Coco 2in1 Puppy Wash, in no time I'm super clean, shiny and I smell great too! After all, I don't want to be a show dog, I just want to look like one..."